Mom needs to get in front of the camera too! 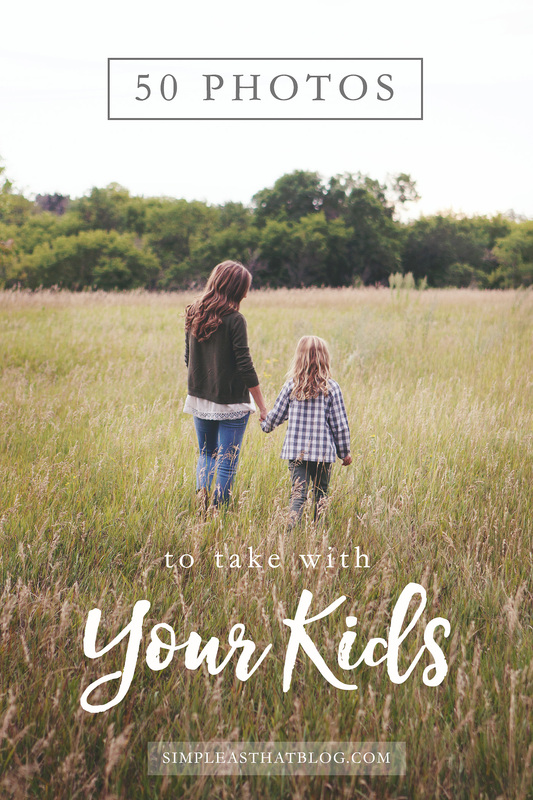 Use these quick tips and download the free photo checklist at the bottom of this post to help you get out from behind the camera and into those memories with your kids! I believe that the photos we take are a reflection of what’s most important to us, and for a lot of us, those photos involve our loved ones. We want to capture the memories we share with those we love, and as photographers, we sometimes forget to step out from behind the camera and get in those photos too! This is your story, after all—it’s important that you step into the recording of it. Now I know what you’re thinking: But my kids are so cute and I’m having a bad hair day. But that’s not what your children see. 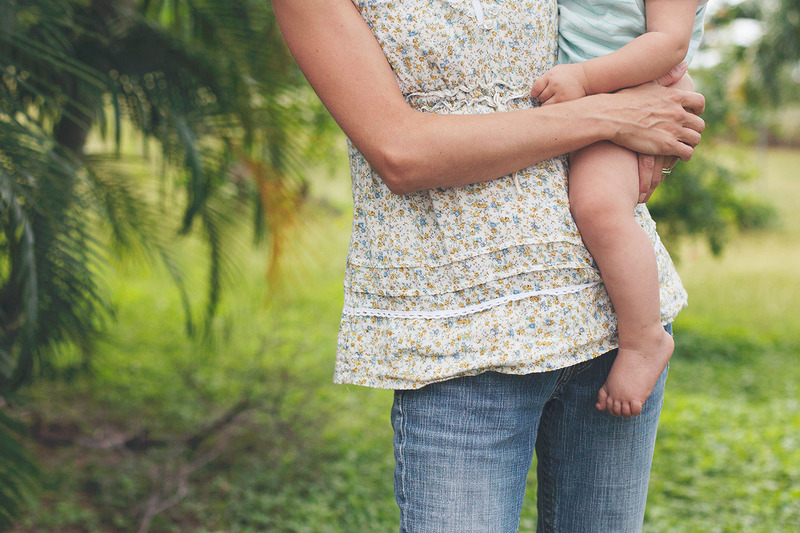 When my children look at a picture with me in it, they don’t notice the bad hair, the lack of makeup, or the few extra pounds of baby weight; they see special memories, a mom who loves them, shared smiles and warm embraces. These photos are a gift from me to them. 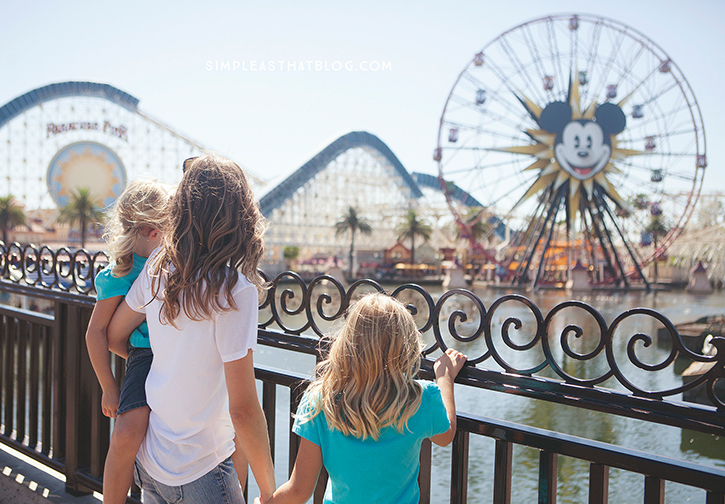 A few years ago I made a conscious decision to get in more photos with my family. 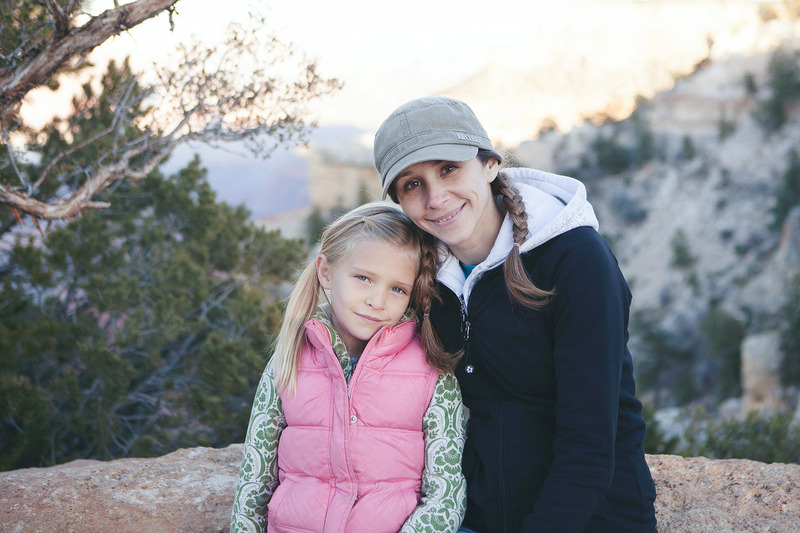 I’d spent too long avoiding the camera, and as I looked at some of the few photos I did have with my kids, I realized how important those images were to me. I wanted to get in more photos, but how? Here are a few ways that I was able to overcome my hesitations and get in more photos. Let It Go – Let go of the dream of the perfect moment when your hair’s done, you’re in your favorite jeans or a professional photographer happens to be standing nearby to capture you at your most flattering angle. Seize the moment, however imperfect it is, and get in that shot! A lot of the photos I have of myself are a little out of focus or the lighting isn’t just right. It’s the price you pay when you snap a quick selfie with your phone or turn your camera over to a family member. Imperfections and all, these photos are still precious, and trust me when I tell you that the f-stop you used or the slight underexposure won’t matter when you look back on these images years from now. Make It a Habit – If you aren’t used to hopping in photos, it will take some time to make this a regular practice. It takes a conscious effort to remember to turn the camera over to someone else once in a while, but it’s worth it! 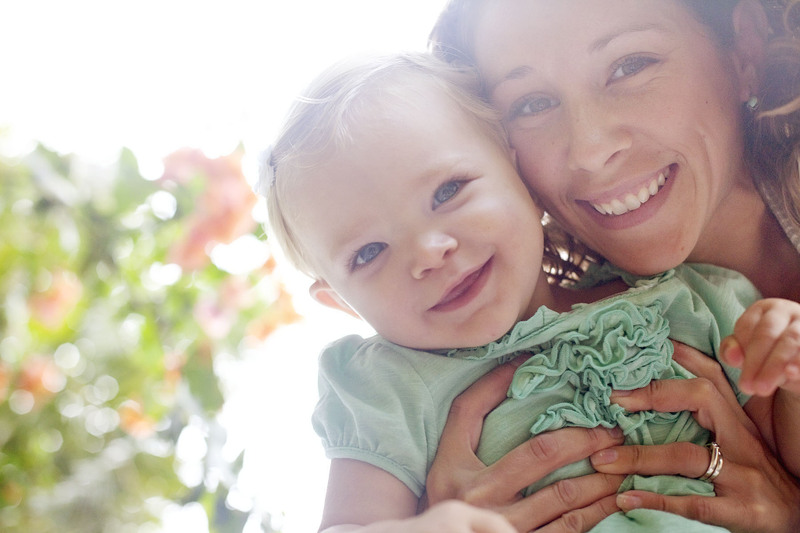 Even if it’s uncomfortable at first, try to make it a habit to hand your camera to someone else, use your self-timer, or even take a mom-and-me selfie with your phone. Make a goal for yourself to get in a certain number of photos a week, month, or year, and go from there! 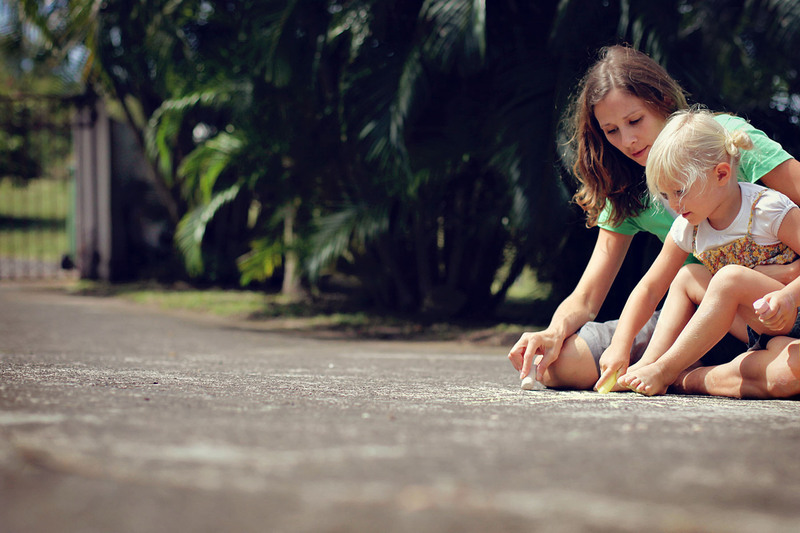 Keep It Fun – I am always looking for ways to make taking photos fun for my kids. When they associate taking photos with fun experiences, they’re much more willing to cooperate when I want to take their picture. Getting in photos isn’t just about the end results (a photo with you in it); it’s about being involved in the photo-taking process WITH your loved ones, not just taking photos OF them. Being silly, playing, and getting some photos in the process makes it fun for everyone. Get Creative – Not feeling inspired to jump into a photo quite yet? Try getting creative with ways to acknowledge the fact that you were there, without actually having to be photo-ready. There are many times throughout the day when my hair isn’t done or I’m still in my PJ’s or I just don’t feel like being in a photo, but special moments don’t wait to happen when I’m at my best. No need to avoid the photo situation altogether! Simply crop some of yourself out, or snap an image of your shadows or a blurred reflection. 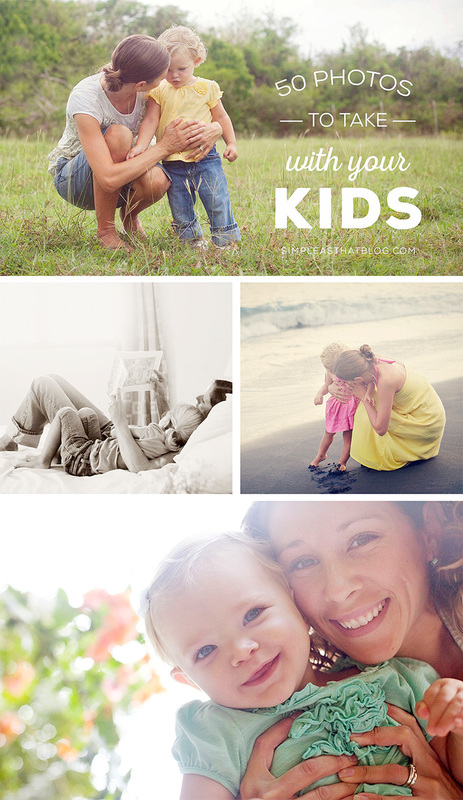 Need a few ideas of photos to take with your kids? I hope you’ll think of these photos as a gift to your children—a chance for them to see, every time they look at a picture with you in it, how much you love them and how they’ll always have a place where they belong. 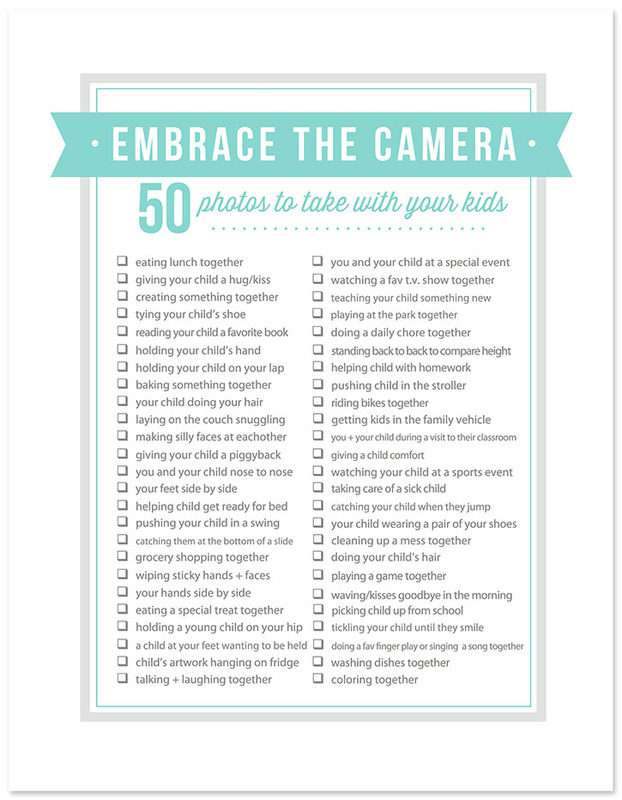 Check out my printable photo checklist filled with 50 fun photo ideas designed to help us moms get in more photos with our kids. No more excuses….it’s time to grab that camera, figure out the self-timer or hand it over to your husband, and get smiling! I completely agree with this! I have hundreds of photos of my son alone and with my husband. I have very few with me in it. Great ideas of how to be in the photos too! thanks so much for reminding us of this, and for the wonderful photo checklist. It’s awesome, and it’s greatly appreciated! Just recently, my younger daughter was fiddling around with my camera. only after downloading, did I see, that she had secretly taken some pictures of me. And guess what, they were a bit out of focus, but they were lovely! I’m gonna do this more often. I’ve just discovered your blog and love everything about it! My apologies too because I also discovered your Pinterest page and have been going crazy! This list is the perfect scrapbooking prompts, printing this for sure. 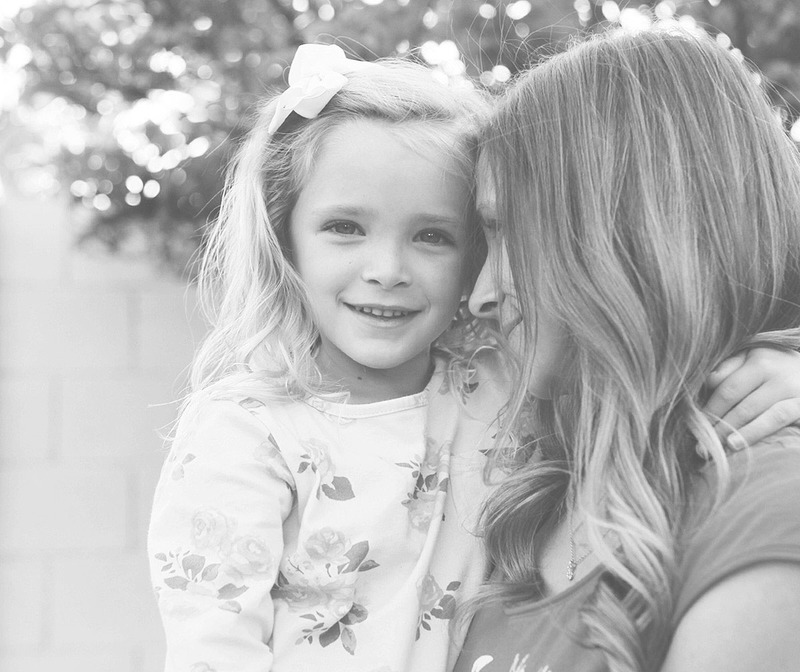 I think just about every mom will admit that when she looks through the pictures, she’s usually not in them (myself included). This is a good reminder to get on the other side of the camera! This is great! I think I only have few photos with my daughter and she is already two. I am always behind camera!! Rebecca, I try to get into photos but I have issues with focus (camera focuses on wrong place, makes someone blurry, ect). Any tips/tricks? I’m usually using a tripod. Thanks! Hi. My kids are grown now. Last summer I had a life-threatening illness, and when I came out of it and as I talked about it with one of my grown daughters, one of the things she mentioned with the most anxiety was, “Mom, do you know I could not find one picture of the two of us together when I was little?” I guess they were looking for photos for a memorial service program or something [gulp!] That broke my heart, and it’s nothing I can do-over. My hair wasn’t right, or I was too fat, or taking photos when they were young brought back horrific moments from my childhood when my dad tried to take family photos. While I resolved early in my marriage to never make photo-taking an overly dramatic event like he did, I also missed out on some beautiful moments of opportunity that I could have captured. Makes me sad now. They say, “Live with no regrets.” Those missing photos are my biggest regret! 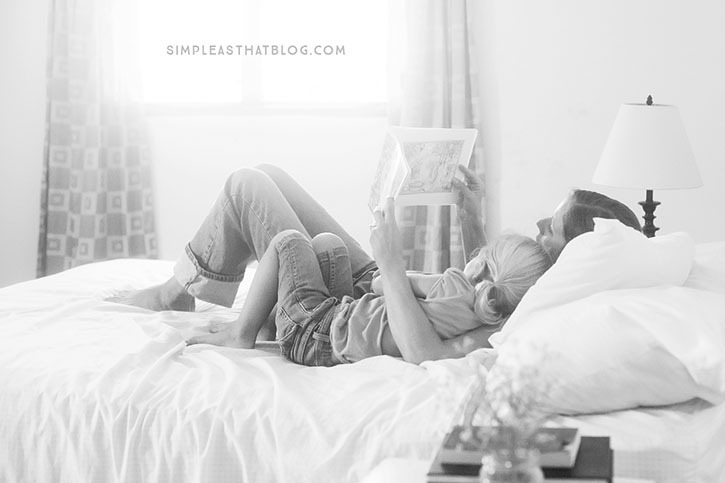 I absolutely love this… With 3 kids I’m constantly taking pics of the kids but I realized when I was working on their scrapbook that I had so little of me with my kids. So thank you for the checklist. This such a wonderful idea, wish I had read this when my children were small, now my kids are all grown up and I have one grandchild. Any ideas with grown children or grandkids.